Kristjan Randalu is an Estonian pianist and composer; I would like to say jazz pianist but that seems limiting yet it is his principal field. 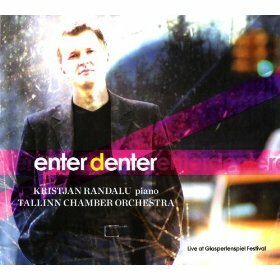 This disc on ERP is a live recording of a 2009 concert the Glasperlenspiel Festival in Tartu with the Tallinn Chamber Orchestra. They perform two of Randalu's works with piano (played by Randalu himself) and orchestra, Nach dem Anfang vom Ende (After the Beginning of the End) and Enter Denter. Though born in Estonia Kristjan Randalu moved to Germany as a child (his father is the pianist Kalle Randalu), and his training included studying with John Taylor in Cologne, at the Royal Academy of Music with Django Bates and at the Manhattan School of Music in New York. Randalu developed the idea for Nach dem Anfang vom Ende whilst living in London in 2001. He wrote three movements there and added a fourth later. Each movement has a title, intriguing and slightly elusive: Der Weg weg (Path of departure), Eine Ahnung in der Vergangenheit (A notion of the past), Spielchen und Rechenschaft (Little games and accountability), Regenbogen (Rainbow). In writing for jazz piano and orchestra, Randalu did not include percussion in the orchestra so that we have jazz piano set against a more classically oriented orchestra. The piano part is not fully notated in the score, just themes and suggestions, with the orchestra framing the soloist. The resulting work can vary in length and here lasting just over 20 minutes. The first movement, Der Weg weg starts with a sense of minimalism with a single repeated note but then this minimal layer develops jazz riffs over the top and the whole movement becomes highly multi-layered The second movement Eine Ahnung in der Vergangenheit is a rather haunted waltz with a rather minimal piano which gradually elaborates on the material. There is an elegance to Kristjan Randalu's piano playing, with the predominant texture being a sense of a single elegant line going to play over the orchestral textures. The third movement, Spielchen und Rechenschaft (in fact the last one to be written), has a bluesy jazz riff in the piano freewheeling over repeated strings. It starts off having a late-night jazz feel before becoming darker and edgier. The final movement, Regenbogen, has a more overall coherent sense of unified texture,- flowing beautiful and at times hypnotising. The second piece on the disc, the title track Enter Denter, is based on tunes from the once popular Estonian children's series Entel Tentel. Each movement has material by a different composer and the title have charming links to the original setting: Hiirejaht (Mouse-Hunt), Karumommi unelaul (Teddy-Bear's Lullaby), Pipi Pikksukk (Pipi Longstocking), Nuku hällilaul (Doll's lullaby), Voilllill (Dandelion). But Kristjan Randalu takes them and transforms them so this is no longer childish music and without knowing the originals we just get hints of tuneful material peeping through. The style is close to the earlier piece, with piano riffs over more formal orchestral sections, though sometimes the writing for the orchestra is more jazz-inspired. The John Adams-ish vigorous first movement, Hiirejaht, leads to the quiet and dark second movement, Karumommi unelaul though hints that the original tune might have been rather perky can still be detected and there are romantic bluesy moments. Pipi Pikksukk has a more obvious tune, but just as things get trite, Randalu produces some rather free-form variations and things get quite complex. Nuku hällilaulis slow and romantic whilst Volllill rhythmic with virtually no sense of pitch until a perky piano melody which becomes fragmented and leads to some quite heavy duty jazz piano. There is an encore a ten minute piece whose title translates as Each One's Own Piano and Orchestra which is based on an Estonian traditional tune. Here the combination of sustained line and rhythmic underpinning is enlivened by some interesting timbres. I rather enjoyed this disc. It is certainly not crossover but is a more than intelligent intersection between classical and jazz. The piano writing is clearly closely related to Randalu's personality and overal there is an elegance to the piece, with no sense of indulgence.